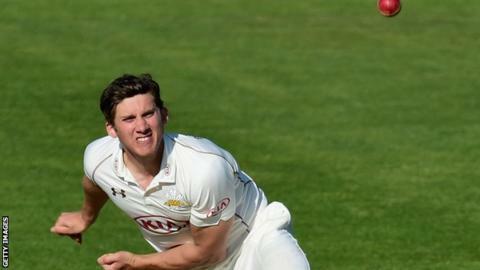 Surrey all-rounder Zafar Ansari has signed a new three-year contract. Ansari has enjoyed a fine season and was recently named in the England squad to play Pakistan, but withdrew after suffering a dislocated thumb. However, he was included in England's Performance Programme (EPP) and Lions squad for the winter, subject to an assessment of his fitness. "I feel that at the moment Surrey is a good side that is getting better," the 23-year-old said. "I am now at the stage in my career where I want to be at a club that offers the best chance of winning trophies, both now and in the future. "With that in mind, therefore, I was very happy to commit to this new deal." Surrey were promoted from Division Two of the County Championship this summer, finishing 10 points clear of second-placed Lancashire.